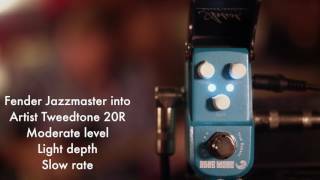 The Blue Wave Chorus micro effects pedal adds width and depth to your guitars tone. It provides a subtle analog chorus that never sounds 'too much'. Even in extreme settings, every sound you dial in stays fully usable. If you need a beautifully transparent chorus that works in many situations, the Blue Wave chorus pedal is for you.